Do you live in the Ravensthorpe Shire? Do you want to be part of a community art project destined to tour across WA? 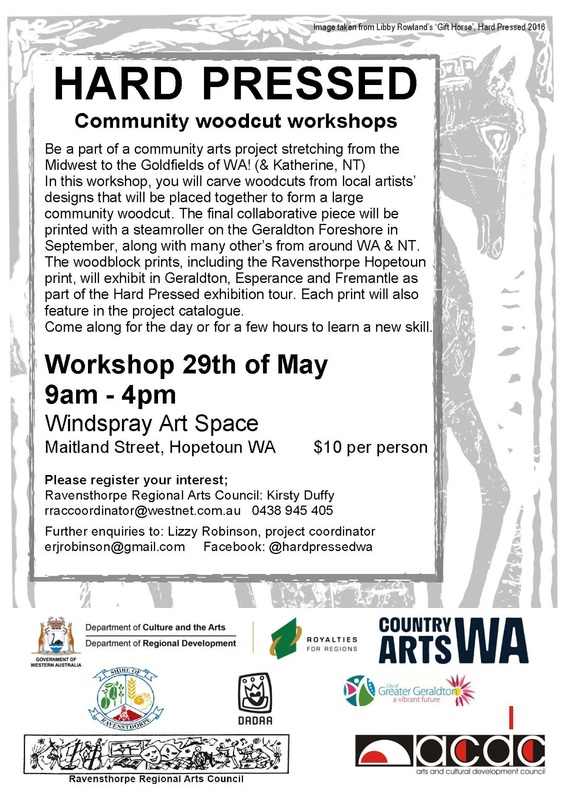 Twelve (30cm x 30cm) designs reflecting the Ravensthorpe/Hopetoun Community or Area are required before 29th May, for the “Hard Pressed Community Wood Block Project”. The designs can have any Hopetoun Ravensthorpe related content, but would be best presented drawn in thick black ‘Artline Texta’ on white paper. The designs will be carved out in flat ply wood. The designs that we receive will be incorporated into a community piece 1200 x 900cm and carved on the 29th May at Windspray Art Space, Hopetoun. Your design may be used in whole or part, or resized to be incorporated into the final whole community print piece. Even if you cannot attend the wood block carving workshop, you can submit a design to be incorporated. No entry fee is required to submit your design. 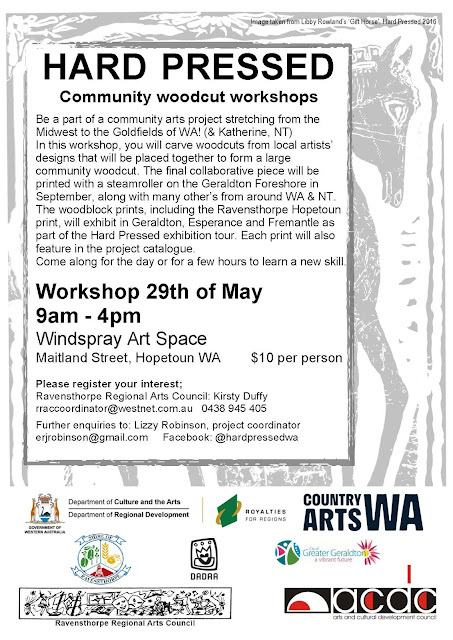 This is a very exciting project and an excellent opportunity to showcase the Hopetoun Ravensthorpe region and its artists. For more information or to register your interest contact Kirsty Duffy rraccoordinator@westnet.com.au or 0438945405.